This post marks the one hundredth post on Frugal Wife = Wealthy Life and we have been thrilled with the response so far. Thank you all so much for your comments, encouragement, and great ideas. To celebrate (since all three of us live in separate states and cannot converge to celebrate over lunch or something equally fun), we're having a giveaway. The prize is, no doubt to your utter shock, related to finances and frugality: one hardback copy of The Total Money Makeover by Dave Ramsey. All three of us (and our spouses!) have read and been very inspired by this book and highly recommend it. If you don't end up winning, you may want to consider checking it out from your local library. To enter, please leave a comment on this post telling us what kinds of posts or topics you'd like to see on this blog in the coming weeks and months. After midnight on Sunday, we'll select a winner at random and announce it on Monday. Good luck! Keep doing what you're doing! In a simple review I would say: Merrick is wonderful at cost-cutting real life tips. Janssen can work the system to save $$ like no other. And Carole offers great perspective and attitude changing inspiration. I can't think of much to suggest except I have really been enjoying the recipes that have been shared (though I know this isn't a recipe blog) so I think that's a fun addition. All the financial advice/savings have been very helpful and enjoyable to read. Keep it up! I have to agree with the previous commenter..cheap recipes are awesome. I hate to be repetitive, but the recipes are helpful. I think the hardest area for me to keep a budget is food because one trip to Costco and my budget is shot. I coupon, but that alone doesn't maintain my 3 months of food I try to keep on hand. Speaking of which, any suggestions on creating/maintaining food storage affordably? I am drawn to the idea of doing with less and living more simply. Maybe some posts that are only tangentally related to frugality, like decluttering? I think posts about food are most useful for me, where that's the largest part of my budget that's easiest to cut. I'd love more posts about saving money on babies/kids stuff. Thanks! I'd love some ideas or a post about if it's worth to refinance your home in a bad economy (lower interest rates?). What do you think about that? I would love to hear more about decorating on a budget- I know that there are options to make things, and places to buy cheaper household decorations, but what are your tips? I think it would be fun to have a post on inexpensive ways to buy or make clothes. Which is better? Like the other day Austin ripped his jeans at our old babysitters house and she told me that if we buy jeans from Shopko they have a 'kid tough' policy that if the pants wear out or get holes in them before the kid has outgrown them they will replace them. I'm sure there are other places or ideas like that that I don't know about. I agree to just keep on. The recipes don't interest me as much as many of your other posts as there are other blogs out there dedicated just to cheap recipes. I love that there is variety though... and always some practical application to work on. Thanks for all your insights and encouragement! I am LOVING this! I have been wanting to read one after reading a financial article in my USAA magazine. I am getting ready (perhaps) to purchase a home in six months or so and I read the post about HUD foreclosures but I LOVE reading about mortgages right now, buying down points, ect. I have also love checling our FICO credit scores often and I highly recommend people check them as often as possible! We had to short sell our townhouse a year ago and I now know all the ins and outs and why short sell is the lesser of the three possible evils! And people need to learn how to FIGHT dicrepencies on thier credit report- we did and we won and it cleared up our awful credit score. I think a lot of people feel a credit score is something they can't change! Anyhow, I am long winded about this! (I sould guest blog for you! haha!) but really I think people need to know they can take charge of thier financial future through managing thier credit score! anyhow, I am LOVING everythign you ladies write! keep it up! and I SURE HOPE I get to read Dave Ramsey's book! Happy 100th post! What a great idea! I really enjoy your blog. I like the posts on frugal living, or ways that you have personally cut expenses. I really like the cheap recipes, but I'm also interested on what your shopping lists really look like. I recall a post that said one of you had a food budget each week of like $30. I can't imagine that. Mine is $70 and that is still difficult some times. Like another commenter, I am also interested in your views on refinancing a mortgage. Love the blog! It has taught me so much! I'm always looking for ways to cut spending, usually in the grocery arena. I have to laugh whenever I read generic "save $ on food" articles where the number one suggestion is eat out less often... that only works if you were eating out in the first place! You three are much more creative! Do you do any investing? It might be nice to read about what you do with your saved money. I want to hear more cheap gift ideas. I am horrible at thinking of good gifts to give, so I'm always rushing to find a good gift right before the occasion and end up spending a lot of money for a gift that I don't know they'll like. But I really liked the posts about wedding and baby shower gifts, and I'd like to hear more about general gift ideas. A chance to get something for free?! I'm not a reader of this blog for nothing! I'd love to see how-to-start-investing-your-pennies for dummies posts. I attended a seminar about investing and came away with two feelings: 1. Start NOW (the difference between starting at 20 vs. 30, compound interest, etc. etc.) and 2. so overwhelmed I had no idea HOW to start. Help? I've really liked the "skills that save money" posts. And recipe ideas are great, too. I love the cent-by-cent breakdown on those posts. Thanks! I love what you've been doing. I personally love hearing about saving on everyday expenses, like baby stuff and I love the recipes too. Oh, I so want that book!! I am so inspired by your blog -- I get renewed with each post. I love the posts about *savings* -- maybe some more investing -- things for the future type posts? Thanks for your great blog! I'd like to see more posts on how you organize your financial life. I'm a bit chaotic myself so seeing your systems of keeping track of budgets, money, savings always helps me. Wow! I can't believe it's already your 100th post! I really enjoy this blog and think you guys are doing great. I can't think of any other topics but I love what you've covered! I love this blog! Great job gals. I'd be interested in hearing how to do family recreation activities on a small budget, home decor for cheap, gift ideas for cheap, and basically motivation to be frugal! I would be curious to hear more about long term financial goals. I've loved hearing you guys talk about paying off debt, paying off mortgages, etc. What about investing? Any thoughts on that? For example, a lot of people tell you to dump money into your 401k, but unless your employer offers EXCELLENT matching, wouldn't it be better to get a nice guaranteed return on your money by just paying off your mortgage instead? Any advice? This is a great blog. Maybe more guest posts - it's always nice to get a different perspective. Also, maybe we could touch on the topic of taxes? Love you guys! Yay for the 100th posting! You three have definitely been an inspiration to me. I think you should continue the topics you have been because they’re all great. In addition I think you could talk about several other things as well. 1. In the spirit of downsizing or “rightsizing” maybe there could be tips on organizing smaller spaces and how to not spend so much on expensive organizer systems. 2. I agree with others that decorating on a budget would be a fun topic, especially for those who may not be so artistically inclined to make everything on their own. 3. How to reasonably start planning for a family. Since I don’t have children and none of my friends do, what are all those hidden costs we should work into our budget over the first year, five years, etc.? I really like hearing your personal stories about life events. I really enjoy reading your blog and have taken to heart many of your suggestions. Our biggest struggle right now is getting out of debt. Unfortunately for us, we are learning a few things the hard way and are desperately trying to get out of debt while at the same time meet the needs of our four children ages 2-12. "Use it up, wear it out, make it do, or do without" is our constant mantra. 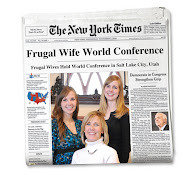 We have discovered many, many ways to live frugally and continue to search for more. Any advice on how to do more with less really helps me out! Thank you for all that you do to help others. I love all the tips and especially the recipes! I like this blog just the way it is! I wouldn't mind seeing more of "skills that save money." 1. Using debit vs. credit- I know Dave Ramsey is a huge advocate of using cash (or its electronic equivalent- debit), but then I read about strategies to use credit to increase your credit score for the purposes of purchasing a home, etc. Seems like a fine line to balance...especially with the flashy gimmicks/rewards some credit card companies offer. 2. Investing- Living debt free is great! But what to do with all the savings? Any recommendations on a mix in this market? 3. "The Dream"- I'm curious as to what you gals are saving for, if you're willing to share. What kind of life do you envision for your families that keeps you motivated when temptation really kicks in? Thanks! Great work! I look forward to the next 100! You guys are doing awesome already. Some posts that I really like to read are on grocery/recipe, housing, baby costs, and skills that save money. I'm so glad that you all offer such a variety of advice. It really makes the blog so much more enjoyable to read! I love this blog! I would be interested in articles on making investments, opening CDs, things of that nature, because I am incredibly uneducated in this regard. I also love the recipes you've been sharing, and have been making all sorts of spending changes because of this blog. Thanks for the hard work! Three cheers for you ladies! I need help with organization big time. Where do you keep your budget and what do you do with all the paper? Would love some more affordable recipes, clothing, and decorating tips. Also would like to learn more about investing - layman's terms, please! Oh! I'd have to second Shannon. How to financially plan for starting for a family would be amazing. We're a few years out but I'm trying to wrap my mind around how much we should have saved up and what the little (or not so little) things are that you forget about. How about some posts on insurance... life, car, home, health? Any tips for saving in any of these areas? I would also like to hear more about decorating on a budget and moving on a budget. And I would love to win the book! You could do a post that features dollarstorecrafts.com. They are awesome! soooo... i'd like to see a post on buying books. best place to buy them? new or used? what if i'm having trouble parting with them - convince me i don't need some of the ones i'm not reading. Not to be unoriginal, but I enjoy the grocery/recipe posts. I'd particularly love posts on eating healthfully on a budget. It seems most coupons, etc. are for pre-processed foods. I love the posts on paying down debt and of organizing money into different bank accounts. It's always good motivation! I would love to read more about investing. I feel like I am really good at cutting costs and not spending money, but then what doesn't go into the Roth IRAs just hangs out in the money market account, or maybe in a handful of CDs. There has to be something better, but I'm not sure what it is. Love the cheap/healthy recipes! Second runners up: cost-saving tips and homemade cleaning products.